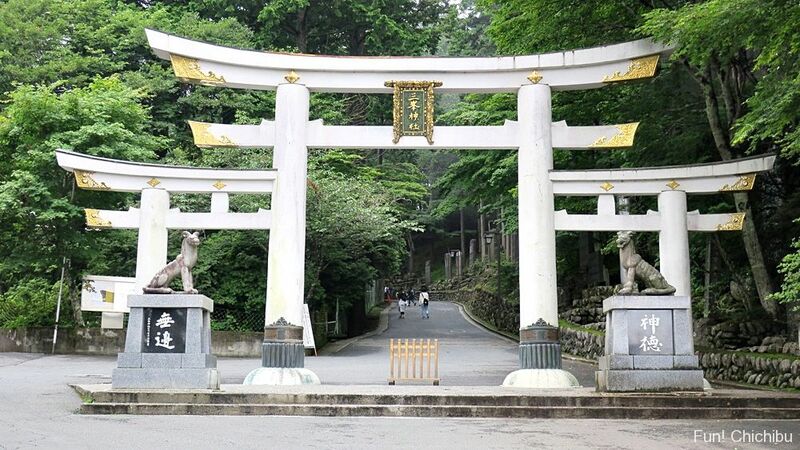 Mitsumine Shrine, which attracts many visitors and worshippers, is known as a great spiritual and sacred place. Furthermore, only on the first day of each month a white charm is distributed. Therefore, on these special days, the shrine gets crowded and traffic congestion occurs as people make the journey to obtain the amulet. 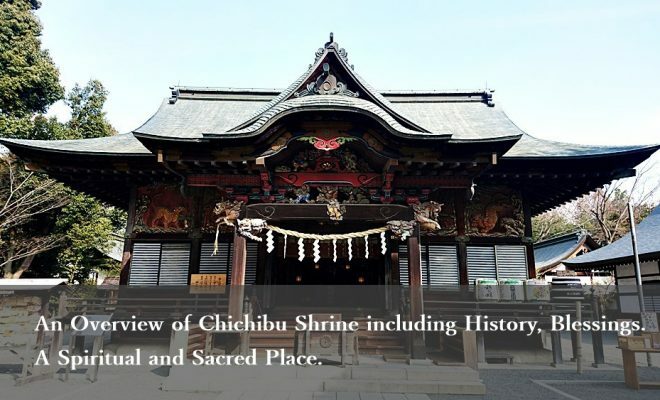 This article will introduce the differences from other shrines as well as the history and blessings of Mitsumine Shrine – which is known as one of the three famous shrines of Chichibu along with Chichibu Shrine and Hodosan Shrine. 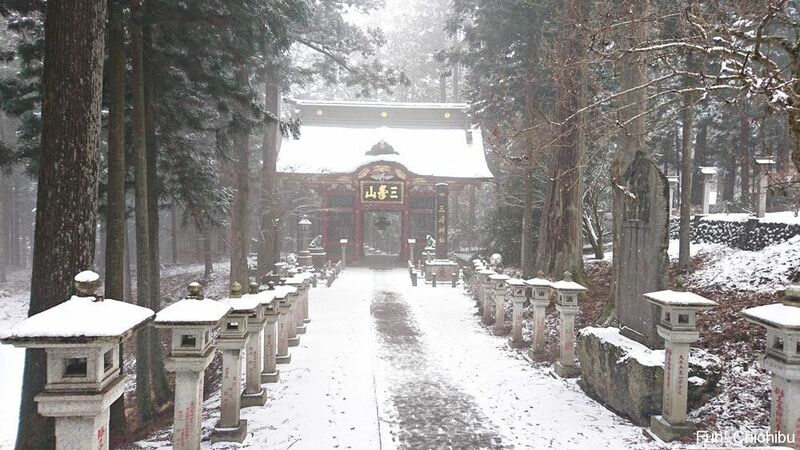 Of the three famous shrines of Chichibu, Mitsumine Shrine is regarded as the shrine with the second longest history. 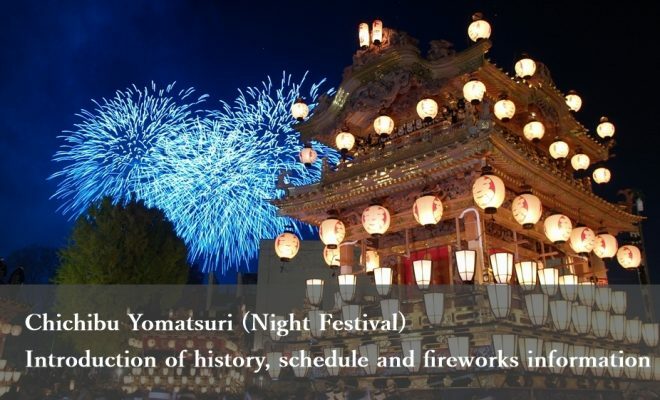 It is said that Yamato Takeru-no-Mikoto established Mitsumine Shrine and there is a big statue dedicated to him in the grounds of the Shrine. 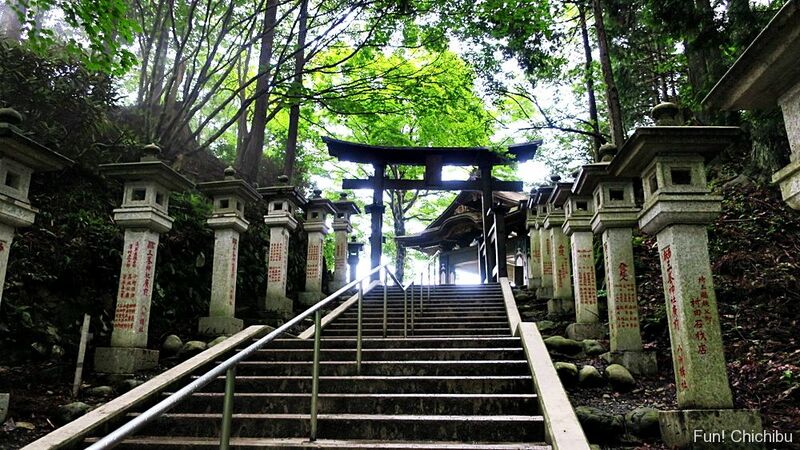 Mitsumine Shrine is located at an elevation of 1100m, the highest of the three famous shrines. 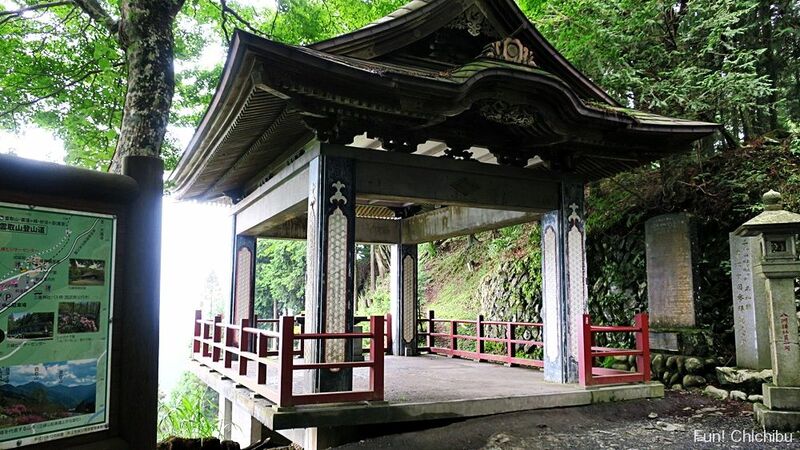 The shrine is located high above Chichibu City, which has an elevation of 200 m above sea level. 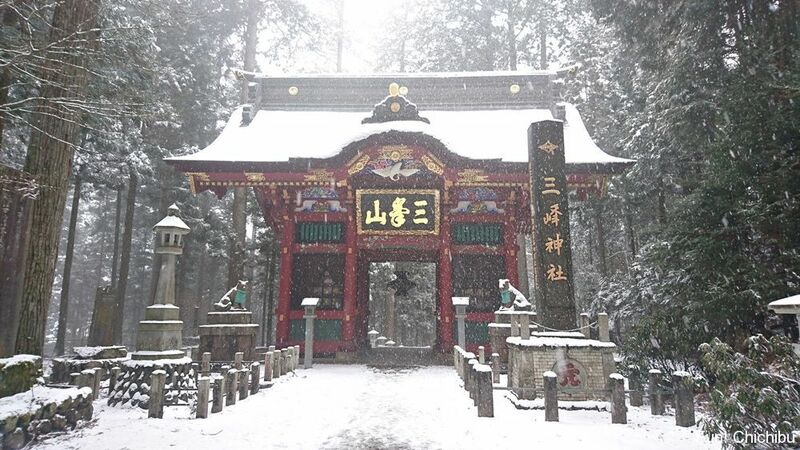 During winter when Chichibu City experiences rain, Mitsumine Shrine may get snow. Although there was a gondola service until 2007, currently the only transport access to Mitsumine Shrine is by road such as bus or car. The Hall of Worship (Haiden) of Mitsumine Shrine was built in 1800. 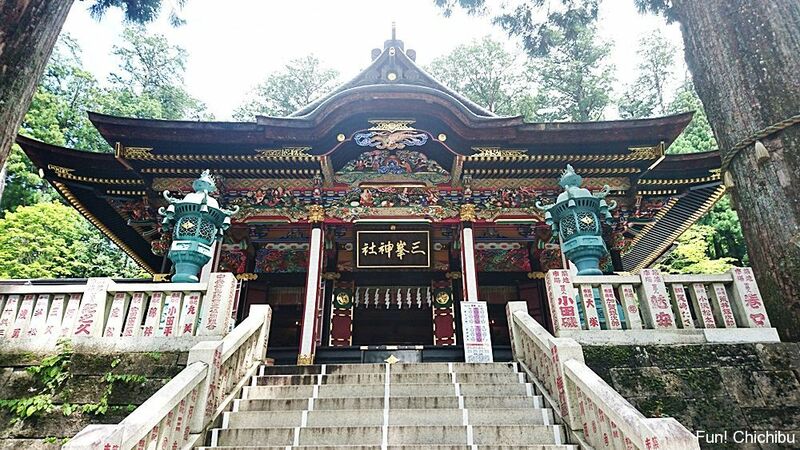 Although the architectural style is Kasuga-zukuri, different from the Gongen-zukuri of Chichibu Shrine, visitors will discover gorgeous carvings common to the famous three shrines in Chichibu. The Torii Gate, which is the entrance to the grounds (above picture), is a rare style with Mitsutorii – a combination of three torii gates. 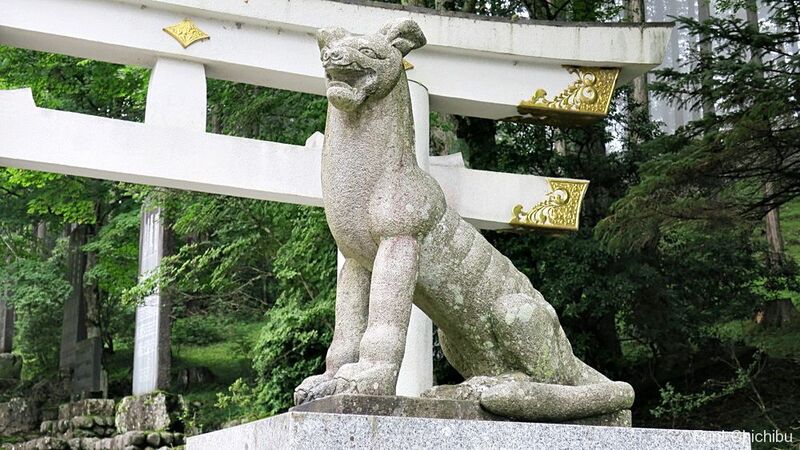 The god messenger of Mitsumine Shrine is the wolf, therefore, the guardian statues are a pair of wolves (not Komainu) facing each other in front of the Torii. 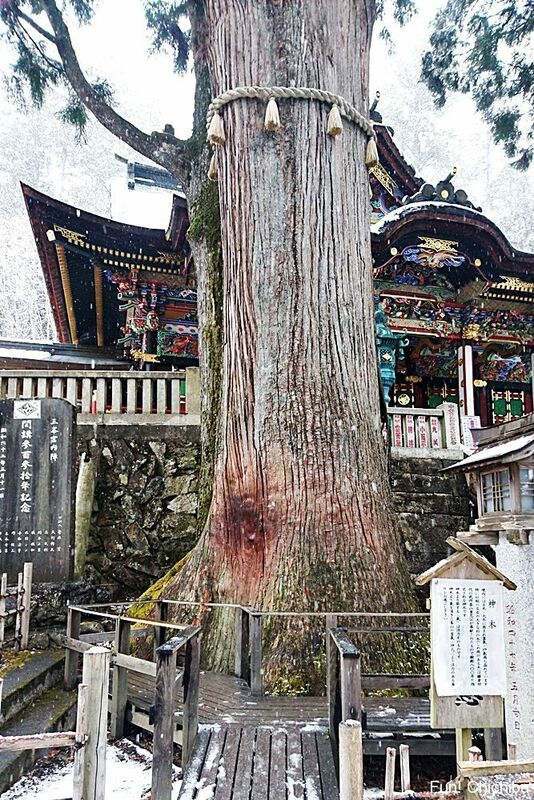 Moreover, the Shigetada-sugi tree, an over 800 year-old shinboku (sacred tree), further contributes to the special atmosphere. The color of trunk of the Shigetada-sugi just above the root is discolored; this is because visitors get life energy from touching the tree. 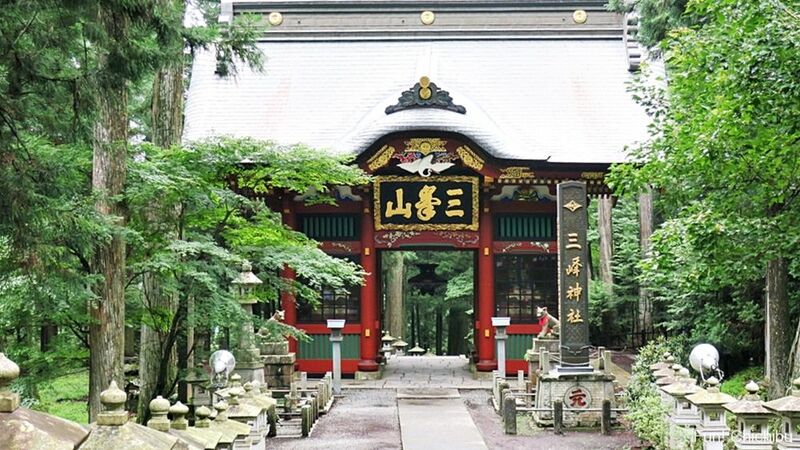 Since Mitsumine Shrine enshrines the gods of married couples, Izanagi-no-Mikoto and Izanami-no-Mikoto, the Shrine provides blessings for marital harmony and a happy married life. Also, since the wolf, the guardian divinity, is said to eliminate the misfortune, there are also following blessings. 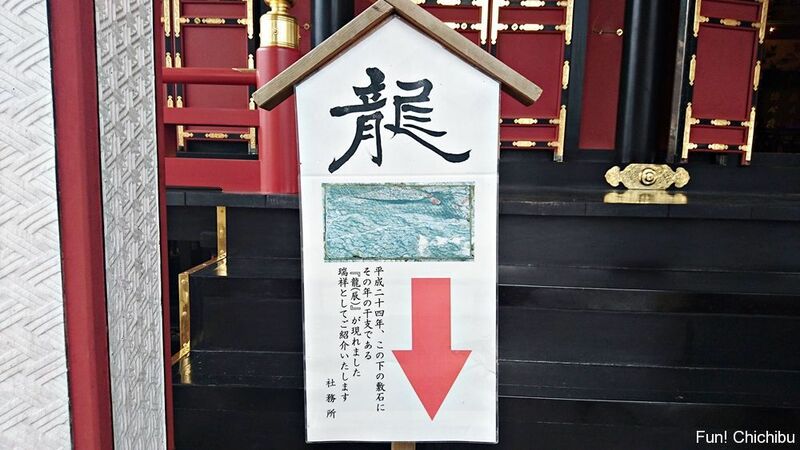 Visitors can obtain charms and Goshuin (Scarlet Seals) at the “Juyo-jo” on the left side of Hall of Worship. A pair of wolves facing each other is illustrated on the Scarlet Seals. 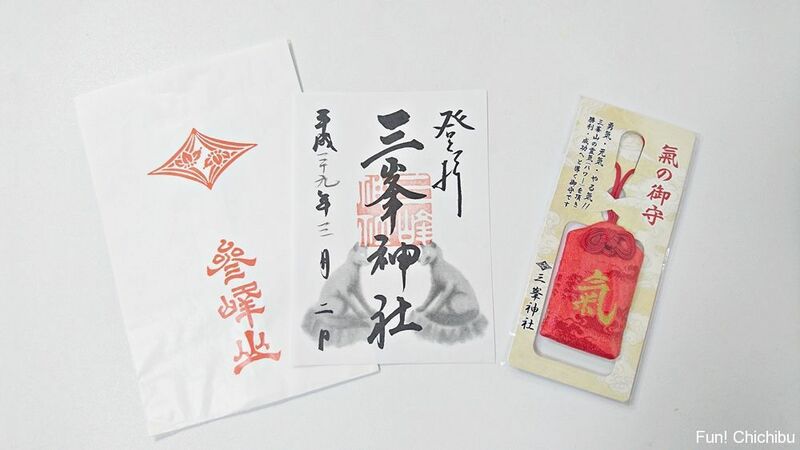 The price of the Scarlet Seal is 300yen and visitors can additionally purchase a Goshuin book (Scarlet Seal book) to have the seal marked in the book. There are four different colors of amulets. I asked about the differences between the colors but apparently there is no difference in the blessings. 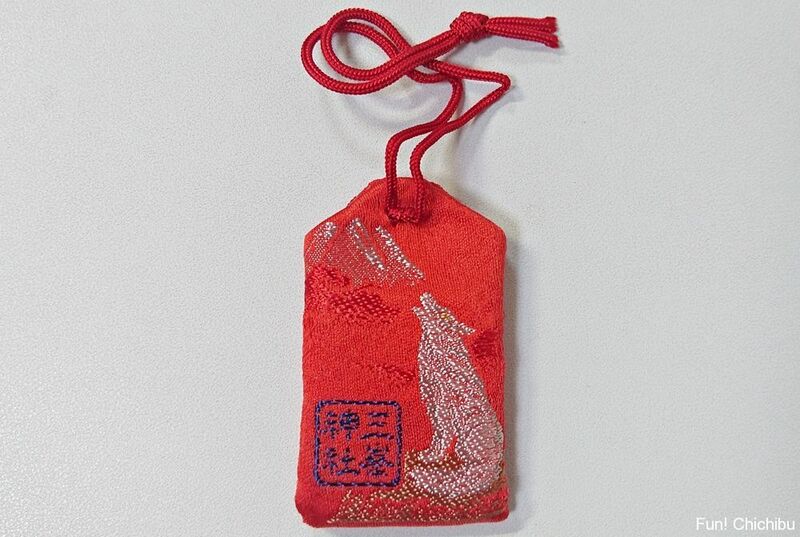 The character Ki (Ki : life energy) is written on front side of the amulet while a wolf motif is on the reverse. Even the design of the amulet seems to have power. 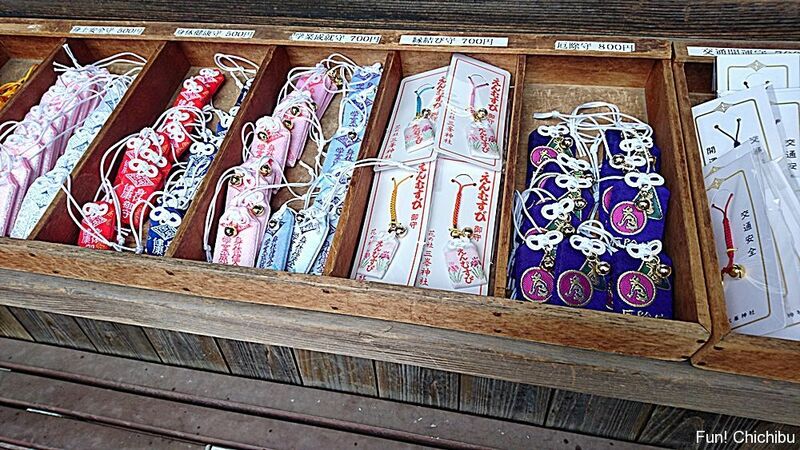 The price of the pink, red, black and green amulets is 1000yen. 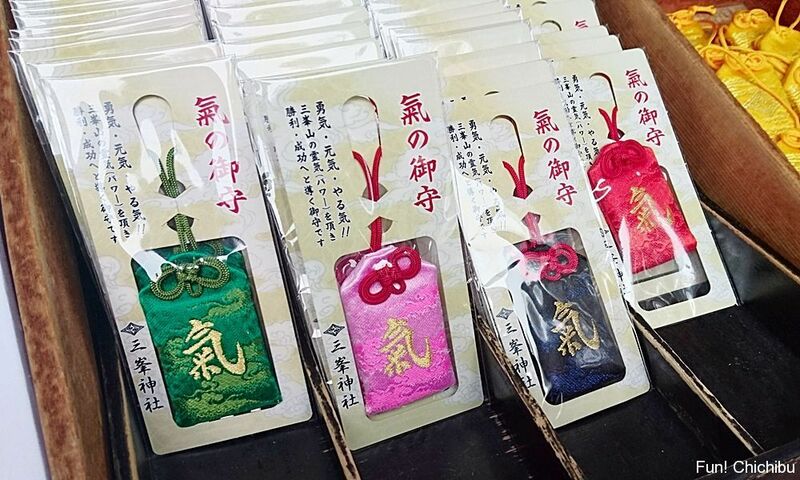 The marriage amulet with a blessing of marital harmony is 700 yen. A pair of wolves (divine dogs) are drawn on a votive picture tablet. In addition, on the first day of every month a white amulet is distributed only for that day. On these days the shrine gets very crowded and to receive an exchange ticket people sometimes wait in line for more than 2-3 hours. I asked if there were limits on numbers distributed but they said no. Visitors can obtain the white amulet if they receive an exchange ticket by 4:30pm on the first day of month and exchange it for an white amulet by 5pm that day. However, amulets are limited to one per person. 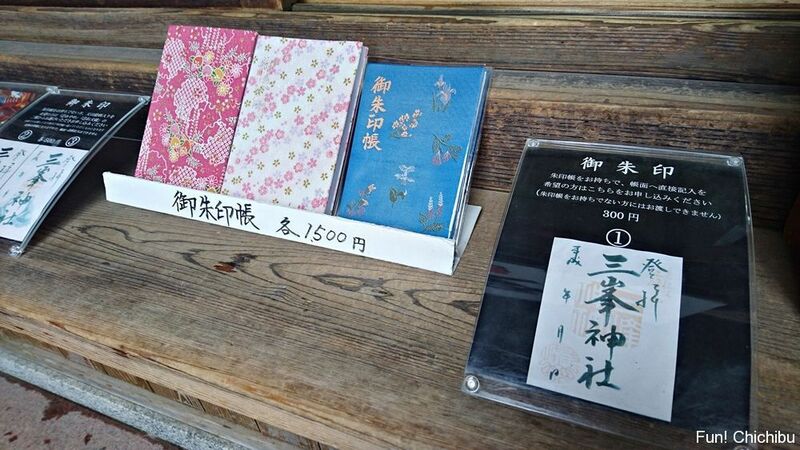 The price of the pink, red, black and green amulets is 1000yen, while white amulets cost 2000yen. One of highlights of the grounds is the Mitsutorii, which was already introduced in this article. The other highlights of the Mitsumine Shrine grounds follow. 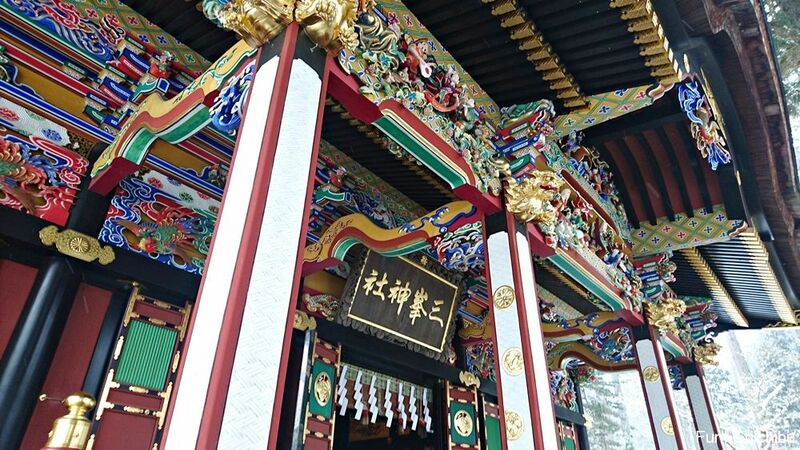 The Zuishinmon was built in 1691, and can be found after going through the Mitsuitorii, the entrance to the grounds, then walking 200m and turning left. There are some shops along the approach to the Mitsuitorii and the atmosphere resembles a tourist area, however visitors will feel different air when they reach the Zuishinmon. 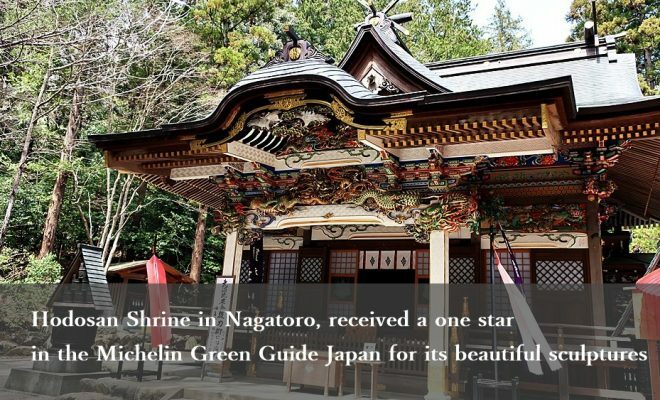 It could be because the gate is surrounded by large Japanese cedar trees and is a tranquil area. This is Zuishinmon on a snowy day. The gate is mystical when seen from a distance on a snowy day. 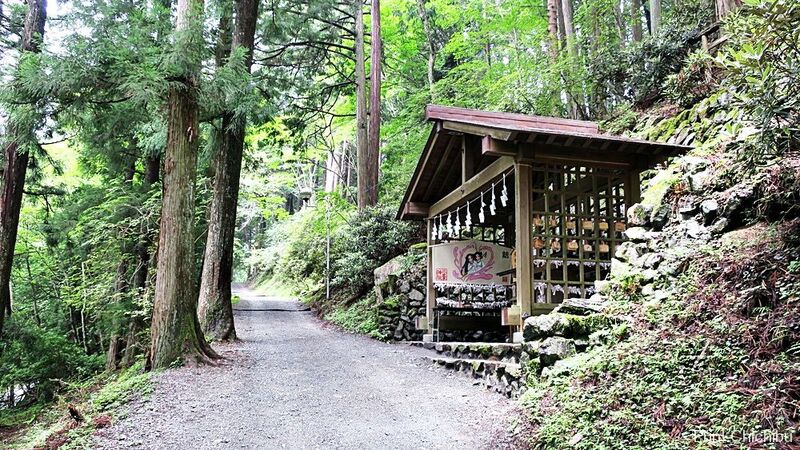 Visitors will find the Mitsumine Shrine building after passing through Zuishinmon then walking about 200m. Youhaiden, views overlooking Chichibu city. Opposite the Zuishinmon, there are steps leading to the Youhaiden, which provides overlooking views of the Chichibu Basin. 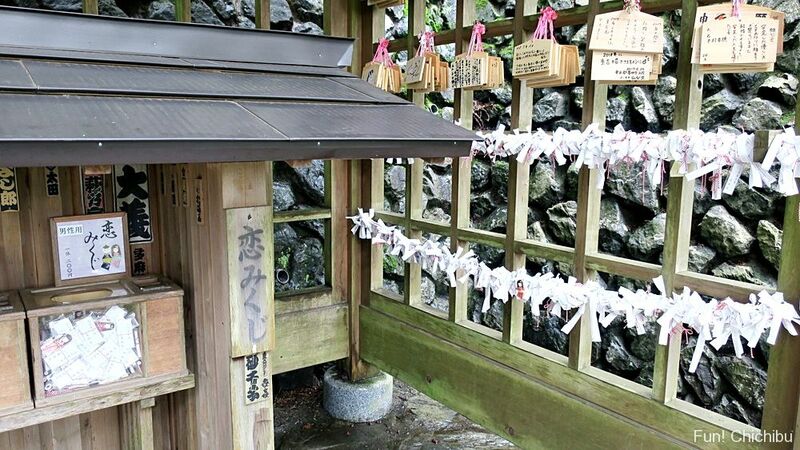 Since it’s an hour and a half walk along a mountain path to Okumiya (rear Shrine), people who cannot reach Okumiya pray at the Youhaiden to receive blessings. The Youhaiden is at the top of the steps. During the daytime on a sunny day, visitors can enjoy overlooking the Chichibu Basin. Furthermore, under the right weather conditions the Youhaiden is famous for its views of an Unkan (sea of clods). The probability of occurrence of the sea of clouds is highest in November, there are tours to enjoy the sea of clouds. 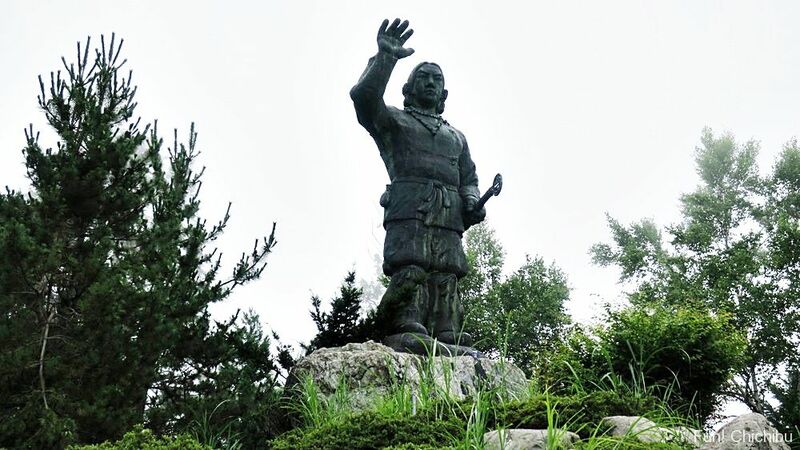 There is a big bronze statue of Yamato Takeru-no-Mikoto, who is regarded as the founder of Mitsumine Shrine. The main body of the statue is 5.2m and looks downward from about 15m above the ground. The Hall of Worship (Haiden) of Mitsumine Shrine is at the top of steps. 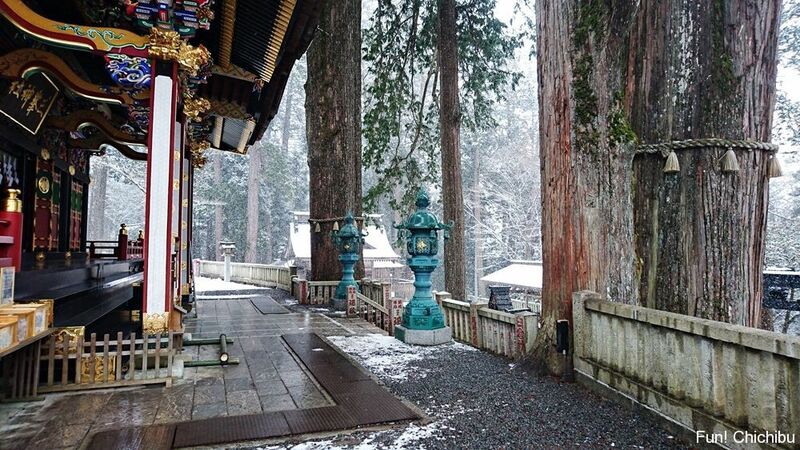 There are shinboku (sacred trees) on the left and right in front of the Haiden. The Honden (main shrine), located behind the Haiden, cannot be seen from the bottom of steps. 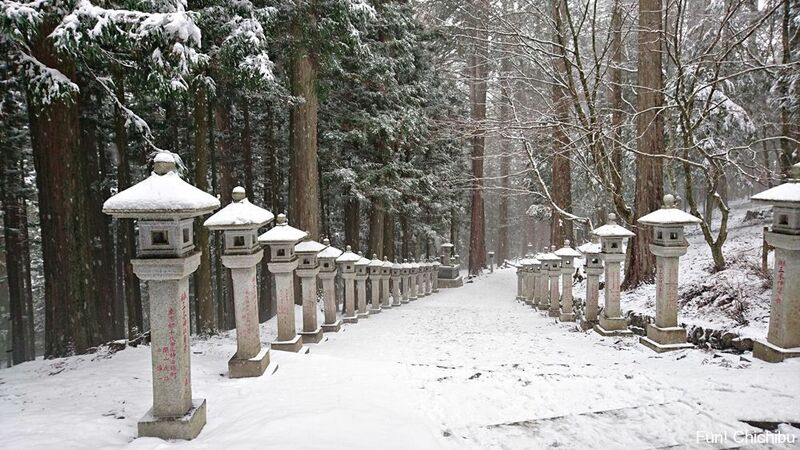 When I walked up the steps and looked up, it felt like I was being protected from the snow by the shinboku. 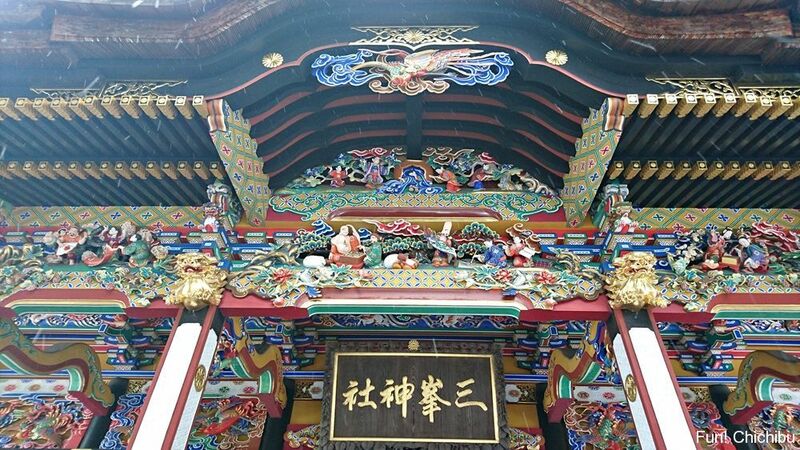 When visitors look up in front of Haiden, they will see colorful carvings. There is an information board that mentions in 2012, the year of the dragon, a dragon figure appeared on a flagstone in front of the Haiden. 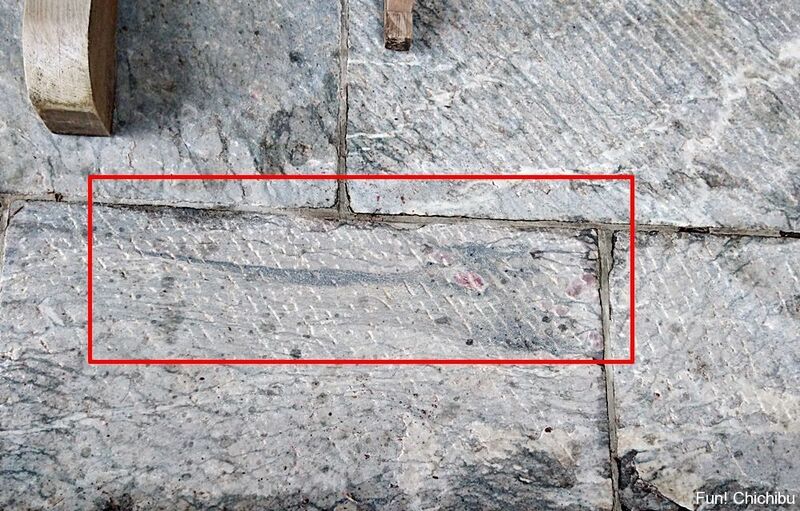 It is difficult see it when the stone is dry but on the flagstone there is an image of a dragon with red eyes. Many people set the photo of the dragon as their smartphone wallpaper. When visitors look the Haiden from the side, it’s surrounded by shinboku – this makes me feel the mystical atmosphere and understand why this is known as a spiritual and sacred place. 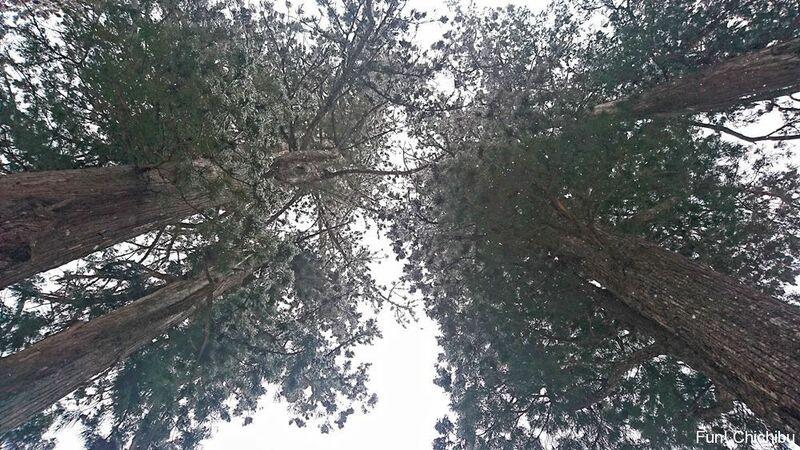 Walking further back from Haiden, there are the trees of marriage, a fir tree and Hinoki cypress are close together. 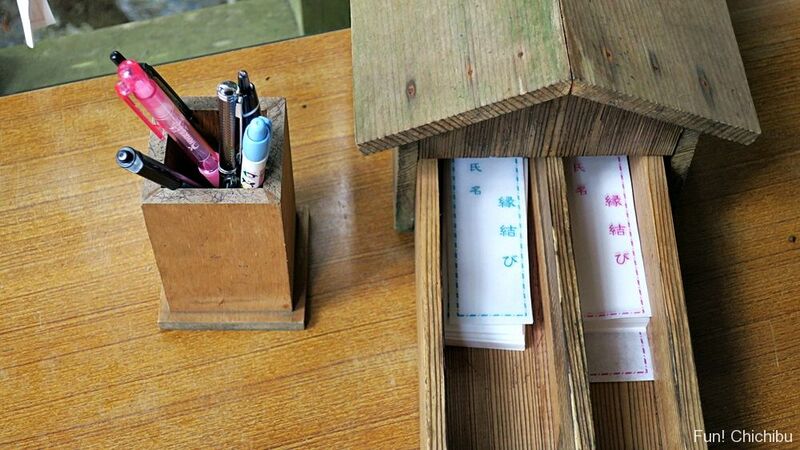 It is said that people will receive a blessing of love if they write their name together with the name of the person they love on a piece of paper and offer the paper to the shrine. Also, there is a love fortune – please try. 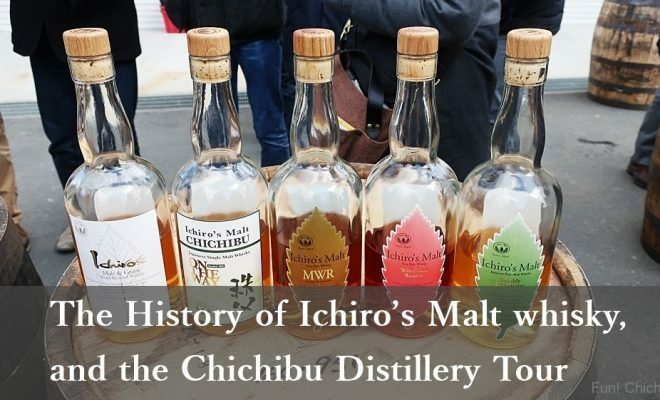 When you head to Chichibu from Haneda Airport, Narita Airport or Tokyo, please head first to Ikebukuro Station. It takes 1 hour and 20 minutes to Seibu Chichibu Station from Ikebukuro Station by the Seibu Line Limited Express Red Arrow. Limited Express Red Arrow has all the reserved seats and the fare is 1,480 yen for one way. 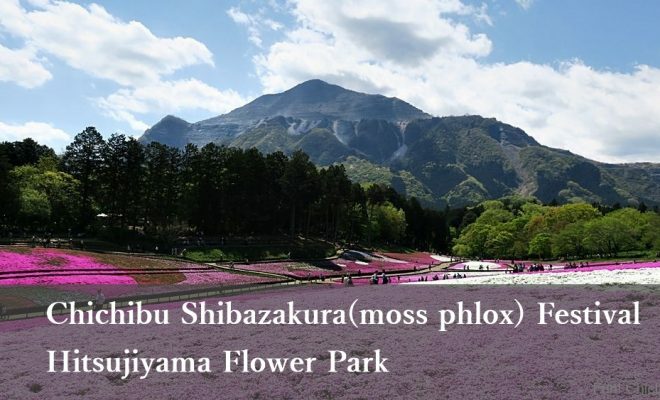 It departs once an hour from Ikebukuro. Mitsumine Shrine is located in a mountainous area at an altitude of about 1100m, therefore the only means of transportation to the Shrine is by vehicles such as bus or cars. 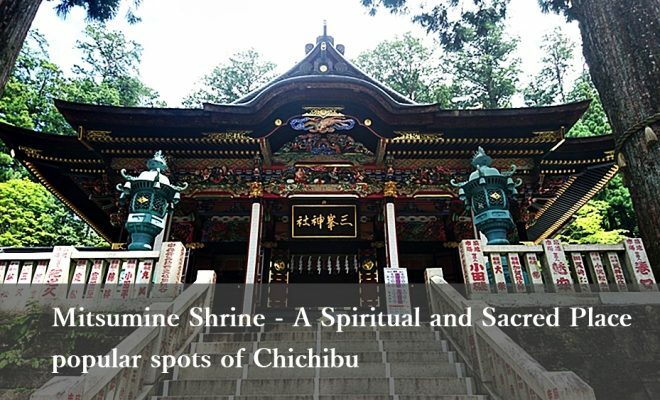 Then take a direct bus to the Shrine from Seibu Chichibu station. However, buses run only 5 times a day, sometime between 9-10am, 10-11am, 12-1pm, 2-3pm, and 3-4pm. The bus ticket price is 930yen and it takes about an hour and 15 minutes from Seibu Chichibu Station to Mitsumine Shrine. The last bus leaving the shrine is between 4-5pm, so please check the return bus timetable when using the bus. I recommend taking a taxi from Seibu Chichibu station to Mitsumine Shrine. Recently, Mitsumine Shrine has been a source of frequent media attention and has become well-known for being a spiritual and sacred place. However, the Shrine has actually been worshiped as a spiritual and sacred place by people for thousands of years. When visiting the shrine, people will understand that the mountain path to the shrine is very long – so I don’t think people in pre-car times could visit easily. 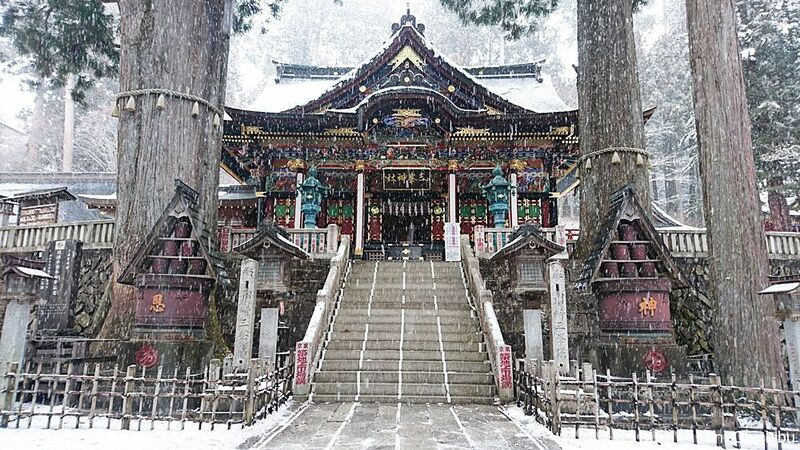 Because of the location, the shrine still retains its ancient atmosphere and mysterious air. 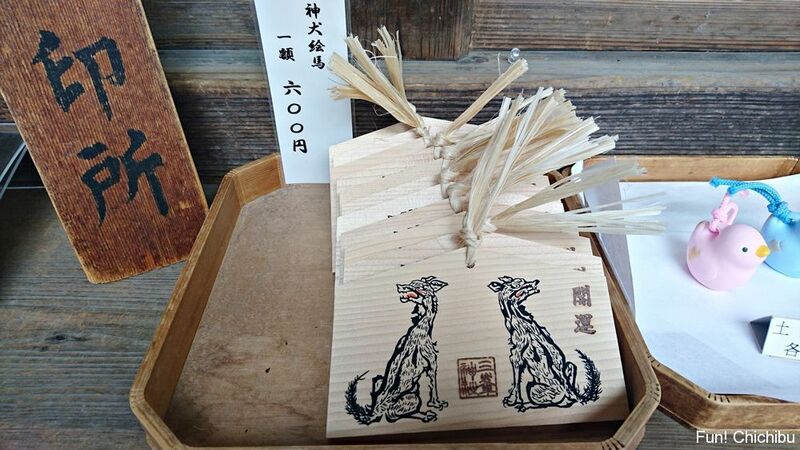 Please visit Mitsumine Shrine to receive Ki (Ki : life energy). Copyright © Fun! Chichibu All rights reserved.